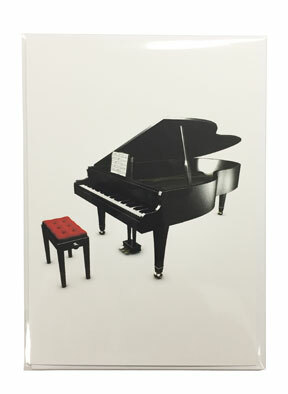 Grand Piano Blank Greeting Card – This simplistic yet beautiful card can be appreciated by anyone with a passion for the piano! Made from high quality card stock, the stationery features a lush illustration of a grand piano along with a red cushioned bench. The blank inside makes it the perfect card for any occasion, from wishing someone a “Happy Birthday” to just a simple “Thank You”. Includes 1 card with 1 envelope. Card size: 6.25″ x 4.5″.